Top row (left to right): 1. unidentified, 2. Bob Thompson, 3. unidentified, 4. Wally West, 5. unidentified, 6. Kurt or Karl Peters, 7. Trina Webster, 8. Dan Short, 9. unidentified. Second row: 1. unidentified, 2. Richard Howell, 3. Sandy Owens, 4. 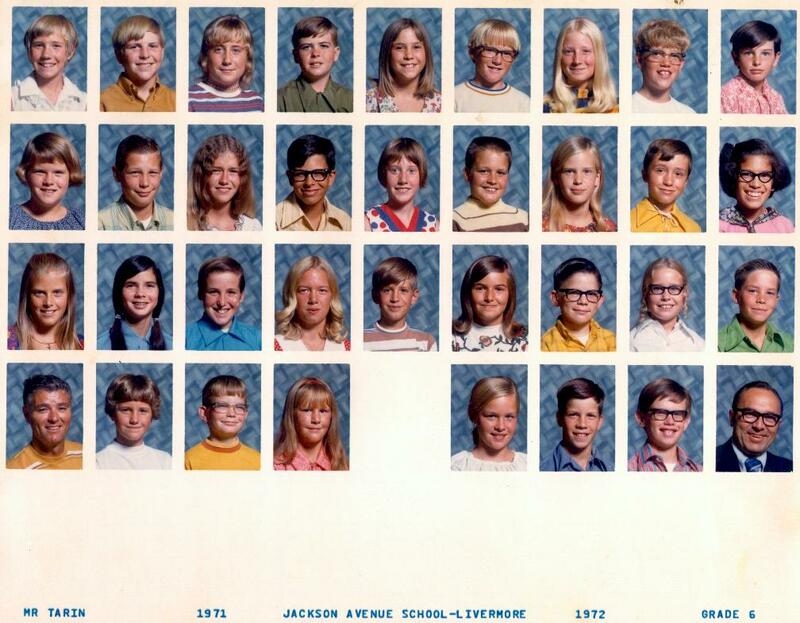 Jeff Gregory, 5. unidentified, 6. Brian Springer, 7. Linda Jenkins, 8. unidentified, 9. Nancy Coronado. Third row: 1. Valerie ? ?, 2. Cindy Alviso, 3. Mike Clary, 4. Sandy Strain, 5. Tim Frary, 6. Trina Sandoval, 7. James ? ?, 8. Lois Johnson, 9. Doug Higby. Fourth row: 1. Mr Tarin, 2. Hillary Ham, 3. unidentified, 4. Denise Bond, 5. no picture, 6. Alexis Horton, 7. unidentified, 8. unidentified, 9. Mr Larson. Credits: From the collection of Ron Simmons. We have only the JPEG displayed on this page. If you have a copy of this picture, please scan it for the archive. Thanks to Michael Cerruti and Sandy Strain-Jackson for identifying the kids in the picture.